Microsoft may be spending more than $1 billion on a social UI for SharePoint. Couldn't one of Microsoft's many skunkworks teams build something similar? Microsoft is reportedly close to buying Yammer, a privately held social enterprise vendor, for more than $1 billion. The deal highlights how the big guns are chasing social enterprise at all costs and defying a good bit of logic. Is this worth more than $1 billion? On the surface, Microsoft's move to acquire Yammer makes some sense. Yammer is fast growing---at least that's the perception. Microsoft doesn't have a cloud social collaboration tool. And Yammer can fit into Office, SharePoint and Dynamics. And the biggest reason Microsoft is buying Yammer is the most simple of all: Salesforce has nailed the social enterprise lingo and Microsoft can't allow Marc Benioff to have all the good punch lines. Salesforce.com buys Radian6, BuddyMedia and touts social enterprise as it chases chief marketing officer dollars. 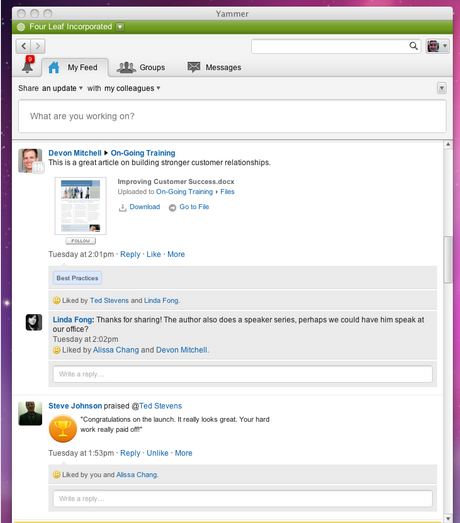 Oracle buys Collective Intelligence, talks social relationship management and its social cloud. Jive Software, Traction, Moxiesoft, Huddle, Social Text and other social plays are all acquisition targets. The acquisition window---and values of social enterprise plays---may also be closing depending on whether Jive's second quarter earnings shine or flop. Color me skeptical, but I doubt all of these bolt on deals will suddenly result in social enterprise nirvana. SharePoint is sort of social. It is an enterprise collaboration tool, which has been associated primarily with document management. It does not have the ease of use, and familiar UX like Yammer or Chatter. Yammer would significantly enhance the usability of Microsoft's productivity tools, in our view. As a result, we think this means vendors like Salesforce.com must address their product hole in the cloud file management arena. In other words, Microsoft may be spending more than $1 billion on a social UI for SharePoint. Couldn't one of Microsoft's many skunkworks teams build a SharePoint activity stream that can compete? The Microsoft-Yammer deal is a bit nutty if UI and SharePoint are the main drivers. A more plausible theory is that Redmond fears that on the social front, SharePoint 2013 will prove the same disappointment as SharePoint 2010. SP 2013 is about to get released to beta, but early whispers suggest that Microsoft did not enhance the platform's social features to the extent everyone expected. Unmet expectations are the stuff of serious revolts. Now Redmond can deflect most criticisms of SharePoint 2013 by pointing to Yammer's existing capabilities along with Yammer's rather fanciful roadmap. Another theory is that Yammer matters much more for Microsoft's Dynamics CRM, which needs a social hook to compete with Salesforce and Oracle. In the end, Yammer's appeal to Microsoft is largely a defensive move to play the social enterprise game. The battle for supremacy amongst the old guard of Microsoft, IBM, SAP and Oracle (’MISO’) is not unlike Elephant Seals battling for control of the beach and the rights to sire future generations, except that their beach is now of questionable relevance and there are deep seated concerns about past dominance and maintenance contract price gouging. One vendor hand to shake and one throat to choke may have worked in the past, but the one suite approach is of questionable value going forward. Bottom line: It's not clear that buying social enterprise plays and slapping Facebook and Twitter user interfaces on everything will work. Customers should prepare to cut through the social enterprise spin accordingly.